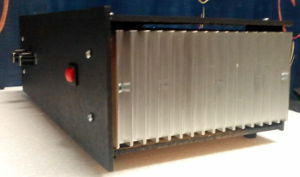 Our amplifier module, CM-5017, which has taken us several years (!) to bring to perfection, is one of the best you can get, no matter what cost. You will hear every single detail of the input signal, but no distortion, no hum, no noise, no coloration. It is the perfect power amp for nit-picking audiophiles, recording studios or just anyone who wants to enjoy the music, not just listen to it. The same module is used in our CM-100-17 stereo amplifier. This page (and sub-pages) will soon be translated into english for our customers abroad. CM-100-17 High-end Stereo power amplifier, with reference quality reproduction. You make the box yourself in about an hour or two, following our drawings, see link below. Then you just fit the electronic components of this kit inside, connect some wires, and the amplifier is ready for work. You only need pliers and a screwdriver to make the electrical connections, no need for any soldering. The kit is based on our best amplifier modules / mono blocks ever, the CM-5017. The sound is crystal clear from extremely deep, dry and firm bass to frequencies above what humans can hear. Sensitivity is enough for direct connection to CD- or DVD players, computer soundcards et.c. without any need for a pre-amplifier. If you want to enjoy your music for hours without getting tired, this is it. Price from 2990 SEK (approx. 355 USD, nov. 2017) plus shipping cost. Click here to read more! CM-5017 Amplifier module (mounted on heatsink, ready for use). Approximate output Power 50 W at 8 Ohm load, sensitivity 900 mV. For you who want a first class sound and can do the rest yourself. Som experience from building electronics is needed. The module itself is solder-free. For the connection only a screwdriver is needed, no soldering. Every single module is tested by us before shipping. Price 995 SEK (approx. 118 USD, nov. 2017) plus shipping cost. Click here to read more!